I have been meaning to mention the Lancaster University "Understanding Walking and Cycling" study for some time, but other subjects cropped up, so it is no longer "hot" news. It is still important news, however, and I link it here to a long account of how the segregated cycle facilities in the London Borough of Camden came to be built, as reflection leads me on to this, and as people have asked me about it, as I have first-hand knowledge, and as knowing about it may be useful to campaigners today, and there exists no good account on the web already. A major study on “Understanding Walking and Cycling” (in the UK) has been conducted by Dave Horton and colleagues at Lancaster University. Its preliminary conclusions, reported to a conference in Leicester earlier this month, have been reported by The Guardian. There is little point in going over the background to all this for the assumed readers of this blog: the very low levels of cycling seen in the UK compared to our continental neighbours, the decades of government strategies and attempts to re-invigorate cycling in the UK by a mixture of promotion, more training for children and adults, and very limited alterations to streets with very mixed results, the controversy amongst cycling campaigners about how cyclists should be accommodated on the roads, the controversy over whether changing driver behaviour, legal framework, cycling styles, or environment was more important. All this is assumed to be known here. Well, there you have it. Or the essence of it. They also mention introducing "Strict Liability" (the burden of proof in civil law for crashes involving pedestrians and cyclists shifted so it motorists have to demonstrate it was not their fault, as they use widely in Europe) and reducing car parking. None of this comes a surprise to me. In fact, I hate to say "I told you so", but this is exactly what I have been going around saying on this subject for about 15 years: ever since I met Paul Gannon in Camden Cycling Campaign in the late 1990s. The Campaign at that time was coordinated (very well) by the (confusingly similarly-named) Paul Gasson, now of Walthamstow. Paul Gasson was essentially a "people person" and an organiser, while Paul Gannon was a visionary, and an ideas person. Gannon had spent some years living and cycling in The Netherlands, and had been very impressed by the success of their extensively segregated cycling infrastructure in getting a far high proportion of the population than in the UK, and importantly, as he was perhaps the first to point out in print, a much more inclusive demographic, cycling: all types of people, in other words, young, old, fit and not so fit, all social groups and both sexes, cycling – in contrast to the predominantly young male culture of cycling in the UK. The reason why... alternative approaches will fail, is that they have been devised by people who, talking only to themselves, effectively live on a different planet from ordinary people, but wish to mould those people to their pre-conceived, top-down notions of the perfect solution to all cycling problems. This was years before Mikael Colville-Andersen talked on the "sub-cultural focus on cycling" in the UK, with "small groups of "cyclists" advocating for no-one but themselves", but the meaning is the same. Additionally, think Gannon probably invented the phrase in English "high-quality cycle infrastructure". I never heard anybody put it this way before he did. He did this to distinguish the continental model he was talking about from the poor-quality infrastructure that UK traffic engineers tended to provide for cyclists. On moving to the London borough of Camden, he correctly perceived that this borough, with its inner-city business-oriented characteristics, combined with a lot of housing (as opposed to other areas such as Westminster, or the City, which have less housing) was a good parallel to the Dutch cities he had experienced such as The Hague, and therefore would be a suitable "testbed" for trying the same high-quality cycling solutions. He therefore set about first trying to persuade the Camden Cycling Campaign, and then Camden Council, that this would be a good idea. At this time London had no central authority, the Greater London Council having been abolished by Mrs Thatcher, and the GLA and office of the Mayor of London having not yet been set up. So decisions on the type and funding of cycle schemes was in the hands of the boroughs. This could be an advantage, as it was often easier to influence councillors at a local level, if they were basically sympathetic, than the remote bureaucrats in TfL that a more recent generation of campaigners has had to deal with. The current cycle scheme being implemented at that time by the boroughs, but with little coordination or consistency of standards, was the London Cycle Network (LCN), the idea of a Conservative transport minister. The implementation was generally in the form of blue signs on grey poles (many of these can still be seen today) pointing the way to routes cyclists could always have taken anyway had they had access to that state-of-the-art piece of navigational equipment for the 1990s, a street map. But often these signs pointed the wrong way down one-way streets, or into other impassable places, so lamentable and lazy was the planning behind the project. In the better places the network was implemented by narrow green-surfaced cycle lanes, either advisory (bordered with a dashed white line), or, rarely, mandatory (bordered with a solid white line). Advisory lanes give cyclists no protection at all and motorists are perfectly free to park in the lanes. Mandatory lanes are supposed to exclude motor traffic, but in practice there is no enforcement of that, and, bizarrely, they don't, of themselves, prevent parking either. They have to be "protected" with double yellow lines – which typically means making a mess of a narrow strip of roadspace by painting on it yellow lines, green surfacing, bike logos, and the white line – typical British over-marking of roads. Gannon's breakthrough was essentially to go around saying to all and sundry that this was all rubbish and would achieve nothing in terms of getting more people on bikes. (The National Cycling Strategy of 1996, a Conservative government document, had projected for a modal share of 12% of all journeys cycled by 2012!) I expect everybody in the London Cycling Campaign thought this as well already, but they all seemed to be too polite to say it, or were feeling too abjectly grateful for any government expenditure on cycling at all to be churlish about the details. Exactly as we have today with LCC and the Cycle Superhighways. Gannon's main publicity method was a talk with a slide-show (we had these things called photographic slides in the days before PowerPoint) which compared LCN "facilities" with pictures he had taken of similar streets with cycle facilities in The Netherlands. He also compared UK junction designs with Dutch ones (more than a decade before the estimable David Hembrow did it) and was at pains to point out how the streets of central London were in no way fundamentally different to the streets in The Hague and Amsterdam. They were similar 19th century grid layouts with similar widths. The big difference was in the efficiency with which the space was used, he pointed out. In London these 19th century streets were very inefficiently used, he said, with unnecessarily wide single lanes in both directions, which encouraged speeding, with the traffic only spreading out to take up all the space when stopped at the junctions, so obstructing cyclists there. Equivalent streets in The Hague had typically had one whole direction of motor traffic removed, with one remaining narrow lane of slow general traffic, wider pavements, and wide physically-segregated two-way cycle tracks which remained segregated right up to the junctions, where they had special signals, or, if not, priority over the side roads. One very important point about Gannon was that he was political realist. He realised, as many cycle campaigners do not seem to, that London is already full of complex activities on the streets, of economic and social necessity, which have to be maintained despite the need to implement a cycle network. The answer, he saw, was not to compromise the cycle network designs so much that they were useless, the usual British procedure, but to use designs that have already been proven in The Netherlands as allowing a high degree of cyclist priority and convenience, while continuing to allow all the other functions of the streets to go on. One key point about the segregated cycle tracks of The Hague, he noted, was that, in a dense urban centre with a lot of business activity, like Camden, they allow the servicing of businesses, a necessary level of car-parking, and use of buses and taxis, to co-exist with safe, dedicated cycle facilities. Bus stops, taxi stops, and parking and loading take place outside the segregating strip of the cycle track, thus the cycle route is genuinely uninterrupted and dedicated. Gannon made mock-up pictures of London streets with Dutch-style cycle tracks inserted into them, to demonstrate that it could be done, and that there was the space, and that it could look very nice. Gannon's argument was never primarily about safety. He was never arguing that cycling in the UK, as it was, was "dangerous", and that proper cycle facilities would be "safer", though there was an interminable debate about safety, where cycling opponents of segregated infrastructure such as John Franklin could never really prove their claim that segregated cycle facilities were "dangerous". Gannon's argument was basically that the vast majority of people found cycling without having to negotiate for space with, large, fast, powerful motor vehicles all the time far more pleasant and less stressful (whether they had had cycle training or not), and were therefore far more likely to cycle if car-free routes were provided. The charity Sustrans later took up this same argument, but in a somewhat different context, not generally dealing with city-centre locations. Gannon thought, correctly, that high levels of cycling, if they were going to occur in the UK at all, would be more likely to spread outwards from the centres of dense cities like London than from cross-country cycle paths. Also, Gannon was never arguing that cycling could be separated entirely from cars. He always recognised that most streets would never have separate cycle facilities, as they did not in The Netherlands, despite their having had decades of building the things already. The argument for segregated, or dedicated, cycle tracks in London was (and still is) an argument for a "backbone network" of a few really attractive, high-priority, direct routes, that would make cycling look so attractive that a large segment of the population would want to try it. Nothing has changed here in the intervening years, which is why the Cycle Superhighways scheme is proving to be such a tragic missed opportunity for achieving exactly this. So, in the late 1990s, Paul Gannon took his slide show round and showed it to everybody: cycle campaign groups, councillors, local authority transport officers, and officials at the Department of Transport (as it was then called). His message was that the cycle facilities being implemented in London were useless, but that what was needed was essentially to copy the strategy which had been so successful in The Netherlands. This message attracted huge hostility from many cycle campaigners. They often argued that there were other differences between London, or the UK, and The Netherlands, that meant the same methods would not be successful here. Another argument was that it wasn't worth trying, as the implementation in the UK would inevitably be too substandard. This is a "defeated from he start" argument which persists today; you often hear it from CTC representatives. Gannon answered many of these objections in this piece which still features on the Camden Cyclists website. In answer to the line, "It wouldn't work here", he would tend to say, "Well, London is very big. There is room in London for all sorts of experiments with different solutions for cycling. We need to try what the Dutch have done somewhere, in at least one or two places, to test it and learn from it". At this time there existed relics in Camden from an earlier phase of cycle facility building, from the 1980s, when Ken Livingstone, in charge of the GLC, had started a programme of implementing routes. One such was the Somers Town Cycle Route, which connected Kings Cross and Bloomsbury, via a crossing of Euston Road at Mabledon Place/Ossulstron Street, to Camden Town. This was mostly on very quiet roads, and some of it was quite good, with some segregated parts in Purchese Street and Georgiana Street. The segregated section on Purchese Street was probably made to avoid having to replace the cobbles there, which acted as "natural" traffic calming. Nevertheless, the fact that some short segregated sections already existed inspired Gannon with the idea of connecting them up with a longer segregated track running along Royal College Street. Royal College Street was a main road, part of the Camden Town one-way system that had existed since the 1960s, aimed at getting large volumes of motor traffic in and out of central London on the north side. It had three nothbound lanes and very wide pavements plus a service road and its pavement. The existing cycle route avoided Royal College Street by taking an illogical detour west and then east again via College Place and Pratt Street. 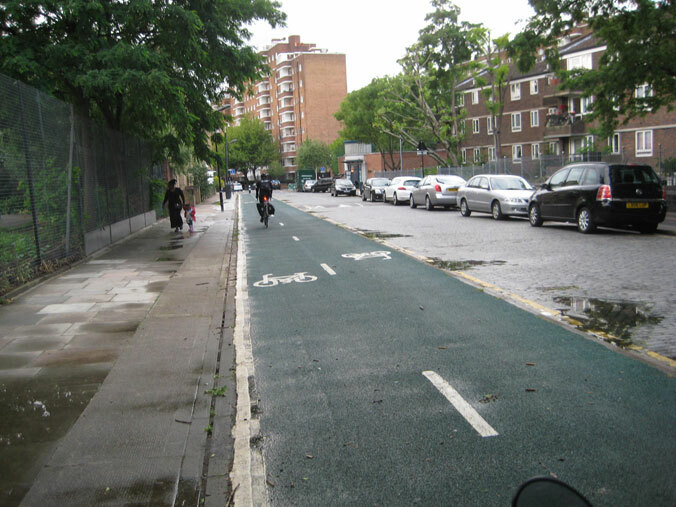 About 1998 Camden Cycling Campaign (CCC), under Gannon's influence, proposed that the Somers Town Cycle Route be re-routed via Royal College Street by construction of a Dutch-style two-way segregated cycle track, which would take its space out of the roadway, reducing it to two lanes. We (CCC) proposed this should be paid for out of Camden's LCN budget. As noted, there were very wide pavements, plus a service road, along Royal College Street, and the instinct of council officers was to put the cycle track here. It was an important part of the campaign that we did not want space taken away from pavements, and we didn't want a route on the pavement or on a service road. We wanted the direct route on the road, with space taken away from motor vehicles: proper roadspace reallocation, Dutch-style. We wanted to avoid cyclists being mixed up with pedestrians, so we wanted clear physical demarcation, in the form of of kerbs, between the cycle track and the pavement, as well as segregation from the road. The breakthrough was to get the support of a forward-thinking councillor. Councillor Gerry Harrison (Labour) became chair of Camden's Streets and Transport Sub-committee (within the Environment Department) about this time. Not previously a cyclist in London, the campaign persuaded him to take it up. Perhaps because he was new cyclist, he saw clearly the merits of the Gannon vision, which now had become the CCC vision, as most active members of the Campaign now supported the idea of trying to implement proper, continental-style infrastructure in Camden (though other branches of LCC, and LCC's central organisation, remained less convinced). Gerry Harrison it was who managed to push through the implementation of the Royal College Street track against opposition from many other councillors and in spite of many doubts from officers. There were many battles to get the engineering of the track satisfactory. CCC found that, despite not being traffic engineers ourselves, we did have to design every feature, virtually every dimension and angle of the construction, ourselves, as there was just not expertise for doing this kind of thing amongst UK traffic engineers. After pushing to have it not on the road, the main engineer then wanted to make the segregation island far wider than in the CCC design, I think something like 1.5m, and the track correspondingly narrower. We had a tremendous row about “what is the point of wasting all that road space?”, but he was following some guidelines, the origin of which I don’t know, probably national rather than local, which supposedly said you had to have this width for “safety”. This requirement for excessively wide segregation islands was, we pointed out, basically preventing effective segregation from being implemented at all in London, the results of which were very far from “safety”. After we took the matter to higher officials in the council and to councillors as well, the design was changed, and the segregation island ended up about 0.75m wide, with the track about 3.5m wide in total. The treatment of the junctions with two roads that joined Royal College Street from the west, Plender Street and Pratt Street, was critical. The default option of all UK engineers was, and still is, to make cyclists give way. CCC were insistent that we wanted a proper Dutch-style cycle track. This would be completely undermined if it gave way to the side roads. Cyclists would not use if it did. We did get the priority we wanted, but the details were difficult. The final solution was to create speed tables at the junctions of the side-roads, so that the track was on the flat, but motorists crossing it from either direction encountered a ramp. These ramps were re-enforced by "elephant's feet" markings on the main road side of the track, and "stop" lines, warning signs, and flashing lights on the side-road side of the track, to alert motorists crossing it to the unexpected presence of the two-way track. This was undoubtedly the riskiest aspect of the scheme, because UK drivers are simply not used to encountering two-way cycle tracks on one side of the road. There were certainly problems at first with motorist compliance, getting them to give way to the track, and compliance is still not perfect, but we found over time that compliance increased. The Transport Research Laboratory, I think, did a study of the system operating in Royal College Street, and found no fundamental safety problems with the principle of making motorists give way to a cycle track in this way (it is standard on the continent). Unfortunately I don't think this research was published, and it doesn't seem to have influenced subsequent policy or the later London Cycle Design Standards, which have never endorsed this design. Junction design on Royal College Street and Pratt Street. There is a bus stop in the middle distance. Things which you wouldn't have guessed would be a big problem were. Drainage is important on roads. They are normally cambered so they drain to the kerbs. But if you build a segregating island, that prevents proper drainage. The drainage issue is a major cause of expense in implementing segregated cycle tracks, as the Camden engineers discovered. They had to re-construct the drains. Then the surface was not laid particularly flat: much less flat than the road. The reason for this, we were told, was that there did not exist rolling machines in the UK, of the type used for rolling roads, narrow enough to roll this track. So it had to be done by hand. We had arguments as well about the treatment of the bus stops. There was one bus service along Royal College Street, with the stops on the track (west) side. The stops remained on the pavement when the track was built, so how to avoid pedestrians running into cyclists when they tried to board a bus? We didn't think this would be a big problem, but officers did, so they put "give way" lines and mini cobbled speed tables on the track by the bus stops. We thought a zebra crossing on the track at the bus stops would have been better, but we were told this was be legally impossible – in the UK you can only have zebra crossings on roads, not cycle paths, they said, though this cycle path was on a road. But later they put a zebra crossing across the road and the track, seen in the picture above, and a speed table across both, so no consistency there. The problem seems to be that there is actually, in UK law, no real concept of a cycle track on the road, Dutch-style. Cycle paths are conceived of as being away from roads, or on pavements. 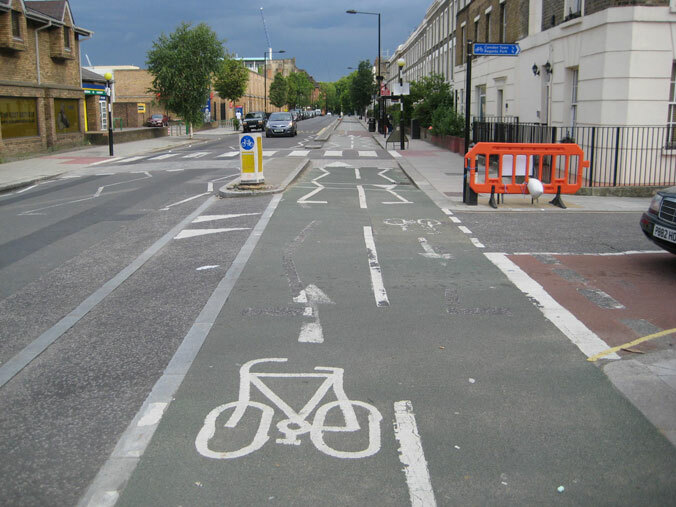 Cycle lanes are conceived of as being lanes painted on the road. But the Royal College Street track is something different, a cycle track that is part of the road but physically separated from it. UK traffic law doesn't seem to allow for this possibility, which is why there has always been argument between officials about the enforceability of priority at junctions with such tracks. We still need the Department for Transport to sort this out and explicitly declare that cycle tracks should have priority over side roads at unsignalised junctions. In the meantime, the Royal College Street track has been operating with this design, with no serious injuries occurring at the junctions with Plender Street and Pratt Street, so far as I am aware, for 11 years now. Consultation with local residents is very important in implementing any changes on "their" streets. Councillor Gerry Harrison and the Camden officers did a good job of bringing the local residents around to support the cycle track project. I suspect this was possible in part because there was already some cycle infrastructure in the area, so there was already a bit of a cycling culture there, and also because it was, and is, a low car-ownership area, with most people living in flats. There was also enough car parking on the service road and in other places so that there was not a big conflict between the track and parking. The Royal College Street cycle track was opened by Jon Snow, the broadcaster and keen cyclist (now President of CTC) in April 2000. He commented that it was an excellent, well-built piece of infrastructure that "went from somewhere to nowhere", pointing out he problem that it still did not allow cyclists to cycle northwards all the way to Camden Town or Kentish Town on a decent route, for it did not extend up Royal College Street beyond the Georgiana Street junction. The route north at the top of Royal College Street was still obstructed by a nasty gyratory junction between St Pancras Way, Camden Road and Kentish Town Road, as it still is. However, at 500m long, the Royal College Street tracks remains – and this is an appalling indictment of progress on cycle infrastructure in London in the last decade – still the longest uninterrupted stretch of segregated cycle track ever constructed in London. Its success cannot be doubted – a council survey after it was constructed showed that many cyclists had diverted from their previous routes to use it, and it becomes very busy at peak times. It cost about £500,000 to build, which gives a gauge for the likely cost of similar schemes elsewhere. Proper cycle infrastructure seems to cost about £1 million per km. This sounds a lot, but £500,000 is probably comparable to the cost of a couple of metres of Crossrail. And what about the M25 widening? In some ways the Royal College Street project was relatively simple. The next CCC plan was much harder to implement. This next idea was for a two-way segregated "backbone" cycle route for central London, running east-west all across the West End and through Bloomsbury and Clerkenwell to the City. Again the brainchild of Paul Gannon, and again supported by the visionary Cllr. Gerry Harrison, this this was conceived as a real equivalent for London to the strategic city-centre cycle routes in The Hague and Amsterdam. The idea was to run it one or two blocks south of Marylebone Road and Euston Road, on a corridor that had no buses to interfere with it, and to have spurs from it to allow cyclists to easily reach all the main rail stations on the north side of central London from the route. The Somers Town Route was already existing as the spur to Kings Cross and St Pancras Stations. The other stations to be linked up were Paddington, Marylebone, Baker Street, Euston, and Liverpool Street. This total of seven stations gave the project its original name, the Seven Stations Link. It later became known, less catchily, as LCN Route 0. The route was based on an existing LCN corridor which had been implemented as painted lanes, and in a few places using road closures, though the design of these was not too good. The idea was to upgrade this route to Dutch standards. This was a far more ambitious plan than the Royal College Street track, with far more junctions and complex existing one-way systems to contend with, and with the much greater density of activity and pressure on space present in the centre of London. The Seven Stations Link project, or SSL, was unfortunately never completed. The project dragged on a long time, and some important parts that were completed was never built to CCC's original specifications. If they had been, the route would have been far better than it is. The project was supposed to span five boroughs: Westminster, Camden, Islington, Hackney, and the City, but even the Camden section was never completed, and little was achieved in the other boroughs. The segregated tracks were implemented from the Camden-Westminster border at Cleveland Street to as far east as Judd Street. West of Tottenham Court Road, the tracks on Maple Street and Howland Street were single-direction tracks on one-way streets. East of Tottenham Court Road, a two-way track was built. Segregated sections on both sides of the road were also implemented by Islington in Skinner Street. However, the two-way segregated sections in Camden were built far too narrow: about half the width they should have been according to the CCC-Gannon plan. The main failure was Camden's refusal to remove one whole lane of motor traffic, as was required in CCC's plan, from the whole of the Torrington Place-Byng Place-Tavistock Place-Sidmouth Street corridor, to allow for a wide two-way track on one side of the road. On the roads where the two-way track was implemented, Torrington Place, Bing Place, Gordon Square, Tavistock Square and Tavistock Place, it was squashed into too narrow a space, severely limiting its capacity. At least we had no problems getting the segregation island sufficiently narrow this time. After the Royal College Street experience, Camden's engineers were willing to entertain the idea of minimal-width segregation. But the two-way rack was implemented only 2.75m wide at best, narrower in places. The failure to remove one direction of motor traffic had another serious consequence, apart from making the track too narrow. It made for a lot of possible conflicts at at the unsignalised junctions, particularly those at Gordon Square, which is a favourite route for black cabs. Resolution of these conflicts is still an ongoing campaign. We lack a culture in the UK of motor vehicles giving way to cyclists on a cycle path or track, mostly because motorists come across so few of these facilities. Despite these problems, the Torrington Place-Tavistock Place cycle track has become hugely popular, and is at capacity at peak times – just as CCC predicted it would be before it was built, and nobody in authority could believe this would be possible: "A cycle route in the UK full up? Who ever would have heard of such a thing!" The sheer success of the segregated track in Bloomsbury has led to calls – from cycle campaigners, of all people – that it should be taken away, as it is too congested! – a bizarre response, as its success is down to its (admittedly flawed) engineering. The correct response is to demand for it to be widened, and for the conflicting vehicle movements to be banned, not to demand it be abolished. The SSL, like most cycle projects, needed to cross local authority boundaries. Unfortunately Westminster, in whose area the whole of the western third of the route should have been, was not interested in proper reallocation of road space. They were not interested in removing parking from streets like New Cavendish Street, which would have been necessary to extend the track west from Camden. And they were basically not interested in spending serious money on cycling. They thought the traditional blue signs of the LCN were good enough. So the high-quality route stopped at the Westminster border. Islington Council was also luke-warm about the project, perhaps because their local cycling campaign also was. The basic problem was that there was no higher authority to drive a strategic cycling scheme like this through. And there still is not. London has a Mayor now, but he has no power over the local road network. Boroughs continue to have a veto on what happens on local roads. The Mayor only controls the Transport for London Road Network, only a few main roads. This remains an absolutely fundamental obstruction to achieving decent cycle routes in London. Tony Blair decided that councils had to reorganise so as to abolish the old committee structure and replace it with a cabinet system (though there was no discernible public demand for this). This meant that the Streets and Transport Sub-committee of Camden Council disappeared, and Gerry Harrison could no longer be its chair. He decided to retire from politics and moved to Ireland. So the CCC lost its most useful ally in the council and the SSL its main political champion. Though there were other Camden councillors interested in cycling, they were not in the right positions of influence. The Licensed Taxi Drivers, a politically very influential group, wanted to retain their two-way rat run on the route of the SSL. They used (use) this mainly as a means of getting between the stations, a source of lucrative short-duration jobs for them. Their traffic should be on the A501, Marylebone Road and Euston Road, but they fought to keep the back-street rat-run two-way. After the abolition of Gerry Harrison's Streets and Transport Sub-committee, the councillor in charge of the Camden Environment Department, John Thane, whose decision it became, was not willing to go against them. I think, as a non-cyclist, he never really understood the arguments behind what CCC wanted, but a major factor here was point E: not all the cycling campaigners in London were saying the same thing to him. If they had been, the result might have been different. As it was, we got the bad compromise of the two-way track in half the width it should have occupied. This was Frank Dobson, MP for Holborn and St Pancras, and at that time a very influential figure in the Labour party. Note that Camden was under Labour control at this time. 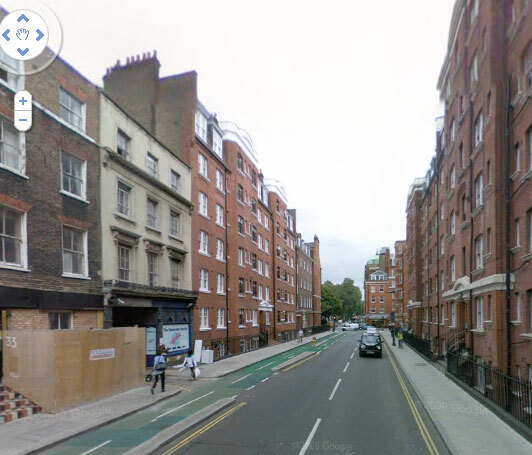 When it became apparent that the council would not remove enough motor vehicle space on the Tavistock Place corridor due to the taxi drivers' lobby, officers explored another option of putting the eastern part of the route further south, on Guilford Street and Calthorpe Street. This was blocked by Dobson, as a trustee of the Thomas Coram Foundation at Corams Fields. This is a charity that provides services for children, particulalry the underprivileged. These children, in Dobson's constituency, some of the most under-provided for, in terms of facilities for physical activity, in the country, certainly would have stood to benefit enormously from the provision of a safe cycle route in their neighbourhood. But Dobson was anti-cycling, and never understood the issues. He believed that a cycle track running in front of Corams Fields would be a danger to the children, and that they would get run over by cyclists! Really. Despite the fact that there already was a busy road running in front of the Fields, and a cycle track scheme would have removed some of that roadspace and slowed the traffic down. So we had the taxi drivers blocking one possible route, and Dobson blocking the other, and Camden officers ran out of options. There was not the political will from leading councillors, after Gerry Harrison had left, to face the opposition down. But the saddest factor, and the one that really put the nail in the coffin, was E.
The London Cycling Campaign overall was never united, and is not united today, on the desirability of engineering like the Royal College Street and Torrington Place cycle tracks. CTC never supported this project either. Islington Cyclists Action Group (ICAG), our neighbouring LCC group, did not support the principle of a segregated route, and some prominent campaigners in LCC such as Rik Andrew, of Kingston, felt CCC's designs were "too expensive" and "over-engineered". So it was easy for opponents of cycling in Camden Council (and there were many of these), and others, to say, "These people in Camden cycling Campaign are extremists. What they are asking for is not what most cyclists want. Other cycling groups do not accept their solutions". This was a big factor in undermining the political will to complete the SSL project properly. I think we could have won against factors A to D if we had not had factor E as well. This is the main lesson I take from the failure to build the Seven Stations Link properly. We are not going to get proper, high-quality cycle engineering in the UK without all the cycling groups, particularly CTC, the largest of them, getting much more united behind the idea. It should be possible, but campaigners need to agree on what is needed. We still lack that basic agreement. We cannot hope to win politicians around while we are divided. The subsequent history of the Camden tracks was that the Royal College Street route was extended northwards a little way, towards Kentish Town, but it was diverted away from Royal College Street on to St Pancras Way. Unfortunately, a bad junction design by led to a fatality on that section, at the Randolph Street-St Pancras Way junction. In my opinion now, it was a bad decision to divert the track on to St Pancras Way. This is because I have now seen much more of the cycle infrastructure on the continent, and I have come to the opinion that it is far better for cycle tracks to follow obvious, direct main road routes. Royal College Street itself is a very obvious, straight route to follow. The track was not continued to the northern part of it, north of Georgiana Street, because it gets narrower there, and there are shops, whose owners might have objected, and there is a difficult junction with Kentish Town Road. I think political will could overcome these obstacles, indeed the shop owners should be glad of a large supply of cycling customers going past their doors, so long as deliveries could be managed somehow. The Kentish Town Road junction could be rebuilt in a cycle-friendly way, and also cycle tracks on Camden Road (both sides) would be a good idea. There is certainly space for them there, but TfL's current obsession with maintaining motor vehicle capacity would have to change. The Cycle Superhighways (CSH) project of the current Mayor has avoided both of the best-implemented existing cycle routes in London, the Somers Town route and the Bloomsbury route. This is probably because they are on borough roads, over which TfL has no jurisdiction. Nevertheless, it is stupid. The opportunity of the CSH cash should have been taken to extend and improve these routes. The Bloomsbury Route, LCN 0, offers an ideal "spine" which, if extended in both directions, could link up all the Superhighways going into central London, which could be a spectacular success if implemented. Unfortunately nobody in LCC or CCC seems to have pushed for this – though TfL probably wouldn't have listened anyway. I am no longer much involved with Camden Cycling Campaign, having moved to the next borough, Brent, and taken part in the setting-up of Brent Cyclists and Harrow Cyclists, in two boroughs which had little campaigning activity before. I have more recently become involved with the Cycling Embassy of Great Britain. Paul Gasson, who was very influential in getting the segregated tracks in Camden built, stood down as co-ordinator of CCC when he moved to Walthamstow in 2004. He was given an "Outstanding Citizen" award by Camden Council, and very well-deserved too. Paul Gannon left London and cycle campaigning to live in Wales in 2006, becoming a mountain guide in Snowdonia. The current CCC committee has fought-off efforts to try to destroy the cycle tracks, from, for example, fashionable architects Terry Farrell and partners, who wanted to implement that ludicrous concept "shared space" in Byng Place and remove the cycle track. But that is as far as it has gone. They have not proposed new schemes of the ambition of those of the Gannon/Gasson era. There is something of a lack of information on the history of the Camden segregated tracks on the CCC website, which is why I have felt compelled to write this account, to "tell the story". It seems there was special combination of circumstances about the year 2000 which led to these ambitious plans from a small local campaign group getting realised, happening to be supported by the right people in the right places in a London council at the time. But I hope the momentum may be regained, if not in Camden, then somewhere in London. The main barrier remains the lack of agreement between campaigners on the measures necessary, but I think more of a consensus is now emerging. The new Chief Executive of LCC, Ashok Sinha, stated more clearly than ever before, this month, on this video, that LCC supports the construction of segregated cycle facilities "where needed". In promoting the Seven Stations Link (a high-quality, segregated backbone link around Central London), we have found substantial support from non-cycling groups such as Local Agenda 21 and many local residents' groups. In the public consultation on the Camden section 76% of residents supported the proposal. Ordinary people say "that is what would get me on my bike". Indeed we must be aware that there are hundreds of thousands of unused bikes rotting in sheds or blocking the corridors of people who have given up cycling because of the conditions – many of whom would cycle if they had continental style facilities. We ignore this at our peril. And there is evidence from Royal College Street that existing cyclists too want this type of facility. The first figures from the council show that cycle numbers on Royal College Street have increased threefold since the segregated track was opened. Now there is no reason to believe that this is due to new cyclists as you still have to cope with the Camden Rd gyratory at the northern end – and every reason to believe that cyclists who previously used the Somers Town backstreet route (through College Place) or the main roads of St Pancras Way and Camden St, and probably other routes too, have switched to Royal College Street. Thanks - both for this superb post, and also all the work you and the two Pauls have done in the past and what you continue to do. I read some of these texts years ago, and it surely helped form my opinions. Phew! A MARRATHON post David, but an important and telling one. There is lots to be learnt here for those of us who are pushing for similar facilities to be built. I wonder can we coax Mssrs Gannon and Gasson out of retirement?! This is a very, very illuminating and educational post, David. Reason 'B' is particularly important at a local level. Blair's pernicious local government reforms removed all the transparency and democratic accountability from Town Hall decision making, by stripping transport committees of their power and concentrating it instead in a single cabinet member, whose decision-making occurs behind closed doors with input only from officers. I remain pessimistic regarding (E). It's good that a wind of change is blowing through the LCC leadership but I see no sign of this being reciprocated at a branch level. And Cyclenation and the CTC remain wedded to their traditional vehicular cycling strategy. David, thanks for an interesting historical account, with many lessons to be learned! This post has also prompted me to have a good look at Google Streetview, it seems I am able to alter my route slightly to make use of the Royal College Street facility. I shall experiment when cycling home tonight from King's Cross to Brent! I am totally blown away by this important and informative account of historical cycle campaigning in the UK. New AND old campaigns should take heed of this report to inform their campaign direction and ambition. Is Gannon's ground-breaking slide show available somewhere? Unfortunately Paul Gannon's slide show is not available; however, a very similar one, made by Jim Davis, Chair of the Cycling Embassy of Great Britain, only this year, is available here. Just to keep you updated with the Royal College Street cycle lanes. There is some bad news and good news here. Recently the National Grid started work on a building parallel to Royal College St. (just as you turn off Georgiana St.). They decided it would be a good idea to completely block the pavement, put up red plastic barriers across the cycle lane and signs saying "Cyclists Dismount". Turns our that what happened most of the time was that cyclists would, somewhat dangerously, cycle against the motor traffic until the cycle lane was available again. The cyclists that did say on the cycle track wouldn't dismount and slowly negotiate the small gap in the barriers that was left for pedestrians. This brought them into conflict with pedestrians. Then there was the compliant minority that stopped, dismounted, walked and remounted to continue their jouney. All in all, the brilliant facility was made largely a pain in the arse by short-sightedness of those of gave NG the permission to erect such monstrosities. Now for the good news. It seems that someone has been either paying attension to the FixMyStreet report, the cyclists, pedestrians and motorists (who aren't exactly expecting cyclists to be coming for them head on), because there is not a temporary segregated cycle lane! That's right someone perhaps saw a picture of the Netherlands and their building sights with suitable cycling provision and decided to implement it. Please go and have a look, and maybe talk about it. It is actually a very good example of what should be happening all over the UK even if it did take 4 months to be implemented. I wrote to my MP, Sir George Young, with reference to your comment about UK law not defining "a cycle track on the road, Dutch-style." He just forwarded this letter to me from Norman Baker MP, Parliamentary Under secretary of State (Transport), in which he replied, "The traffic signs regulations and general directions (TSRGD) include all the signs and road markings necessary to provide unambiguous priority for cyclists using the sort of cycle facility provided along Royal College Street, Camden. If the junctions are marked to give priority to cyclists in accordance with the TSRGD, the ability to enforce these arrangements is not in question." He concluded, "It is the responsibility of local highways authorities to determine how they provide for cyclists, and they are free to decide when and where priority should be provided."